As I mentioned in a previous post a few days ago, I found a nice 2 watt mono audio amplifier board that’s a perfect addition to give speaker capability to a receiver with headphone output. I purchased four of these bad boys since they were so inexpensive (and I was paying for shipping from Hong Kong, so might as well order in bulk). 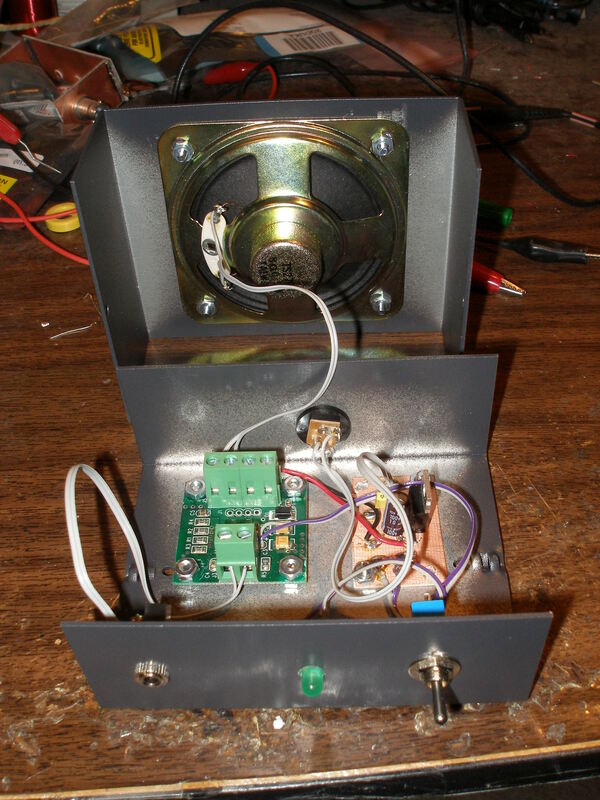 I figured a good test would be to build up a bench amplifier so I could have the convenience of listening to any of my homebrewed phones-only receivers/transceivers (most of them) on speaker. To the right, you can see the pleasing results of this little project. I had a nice Ten-Tec TPC-17 that turned out to be a perfect enclosure. The 1/8″ input connector is on the left, a power LED in the middle, and a mute switch on the right (the amplifier board has an active low mute line which works extremely well). I created a speaker grille drill template in Inkscape for the 3″ speaker bolted to the top lid of the enclosure (if there’s any demand for this file, I can post it here). The actual 1″ x 1″ audio amp board is on the left and a small 7805 voltage regulator board on the right. Here’s the enclosure all buttoned up for use. You can see that the speaker grille is a bit ugly, but it works well enough. There is no power switch, since the quiescent current is so low that there’s no problem in leaving it powered up. Tonight I hooked it up to my VRX-1 (with a rock on 7030) and listened to the wide-open band with the DX contest in full swing. The audio quality was quite nice; better than I remember it when testing it out in the open on the workbench. I’m guessing this is because the speaker was properly mounted instead of having the magnet rattling against the bench. Even though it’s a simple project, it’s a great addition to the shack that makes me wonder why I didn’t do this earlier. Yeah, I could have purchased a set of amplified PC speakers, but that just didn’t seem appropriate. 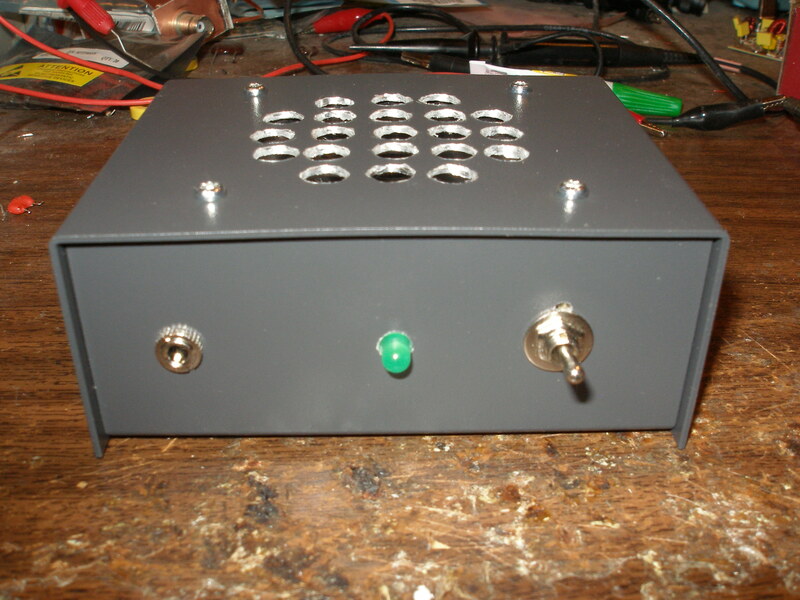 Besides, the amp in the Ten-Tec enclosure looks spiffy next to all of the other similar looking equipment in my shack. I got a bit bored tonight, so I took a video to demonstrate the amplifier working with the VRX-1. Yes, I know there’s nothing to really look at, but the audio is a bit interesting.